The Apollo Altrust allows you to go any distance without worrying about the durability and safety of the tyre. The ideal all-season rugged tyre aimed at MPVs and vans allows enhanced performance under heavy load conditions, irrespective of weather setup. Its robust design and wide contour profile favours better control on long hauls with high load carriage. The high tensile strength tread compound used in Altrust ensures resistance to punctures, cuts and chips. The hassle-free long life with unmatched ruggedness makes it a best fit to people movers and light goods carriage vehicles. Stiff structure of the side walls aids in better steering precision and stability while cornering. Altrust is presented in two rim sizes namely 14-inch and 15-inch, and get single variations in each size. A 5 year standard manufacturer warranty is offered by Apollo on this tyre. Apollo Altrust is one of the most durable tyres in the segment. Meant for long routes, it provides excellent safety and better fuel efficiency. Developed for long hauls it carries reinforced construction. 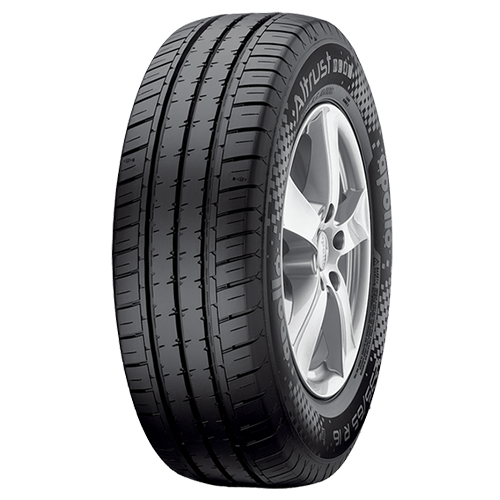 The high on durability tyre is the best bet for MPVs / MUVs in the country. The use of high tensile premium tread compound ensures resistance to punctures, etc. Altrust features joint-less cap ply for long term durability and ensures apt control at high speed with heavy loads. Robust pattern of the Altrust helps face roadside difficulties with ease. Apollo Altrust comes in two rim sizes of 14-inch and 15-inch with different variations. Altrust gets best in industry warranty cover by Apollo Tyres.